"The 2013-14 season was challenging and disappointing," he said. "But we are excited to have one of world's best managers, there is a real feeling we are at the start of something special." Woodward also revealed the club had budgeted for a third-place finish in the Premier League. The sharp fall in profits to £23.8m, from £146m a year ago was largely due to United's owners cashing in a tax credit in the previous financial year. Woodward preferred to focus on the overall revenue rise and commercial income that has gone up by 24.1% to £189.3m following confirmation of a new shirt manufacturing deal with adidas. However, it is clear from the fall in profits that the cost of last season was a heavy one. United paid former manager David Moyes and his staff £5.2m following their exits, while their Premier League prizemoney was reduced by £7.4m following their seventh-placed finish. The loss due to their failure to qualify for the Champions League will not be felt until the next round of figures, but the total cost will end up at more than £50m. 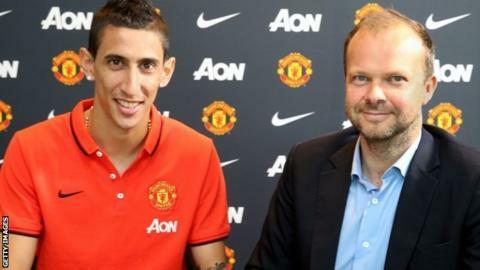 That does not include a £150m investment in six new players, including Angel Di Maria and Radamel Falcao. And further additions in January have not been ruled out, with AS Roma midfielder Kevin Strootman believed to be on current manager Louis van Gaal's radar if he recovers from a serious knee surgery. "We feel we have a stable number in the squad and I wouldn't have expectations around January, but if there is a willingness from the manager to do something and the opportunity arises we will look at it," said Woodward. With so many attacking options, it is still not entirely clear how Van Gaal intends to set his team up. The club have said 18-year-old James Wilson is part of Van Gaal's plans after their decision to sell home-grown England striker Danny Welbeck to Arsenal on transfer deadline day. Tyler Blackett, Reece James, Sam Johnstone and Jesse Lingard are also being cited as examples of United's continuing commitment to youth. "OK, Danny has left, which is obviously disappointing because you never want to see a homegrown player leave," said Van Gaal's assistant Ryan Giggs. "But this is a manager who gave Seedorf his chance, Kluivert his chance, Iniesta his chance, Xavi, Thomas Muller - he has got a track record of giving youngsters a chance. "Tyler Blackett has played every game this season. Underneath [Robin] Van Persie and [Wayne] Rooney you have got [Adnan] Januzaj, James Wilson. "Players will leave but we have got to make sure young players come through because United fans demand it. I want to see young players come through. "That has been (the case) right through the history of Manchester United. We never want to lose that." The continuing rise in revenue means the club are at no risk of Financial Fair Play sanctions, even if, should Falcao's loan move from Monaco become permanent next summer, their transfer spend goes beyond £200m. With only two points from their opening three Premier League games, in addition to a shock Capital One Cup defeat by MK Dons, Van Gaal's reign has not started well. However, Woodward expects much better, at least in terms of United's revenue projection of between £385m and £395m next year. "We assume third place (Premier League finish minimum) in our budgets including next season," said Woodward.